Writing was the first thing I remember doing as a kid without being told to do so. It was an innate desire to put what was in my head down on paper. I used to make handmade books as a kid out of notebook paper, using cardboard as my front and back cover and tying it all together with my mother’s crochet yarn. I didn’t decide to become a writer, any more than a bird decides to be a bird. There’s really nothing else that would make me as happy as writing does. I wrote my first novel when I was eighteen. I didn’t get a publishing deal until I was twenty-nine. So eleven years of rejection after rejection. I began to fear I’d never be published. So I think the biggest thing in following my dream was to never give up. It was hard, because getting published is such a hard journey, as my fellow writers can attest, but if you give up you’ll be so far from your dream, you’ll never be happy. Shirley Jackson, Donna Tartt, Toni Morrison. These authors are some of my favorites, but I can’t say they inspired me because I read them rather late and had already been writing, and writing a lot, by the time I came upon them. Ray Bradbury. I love him too. I don’t have a routine or schedule that I stick too. I tend to write every day, though marketing ‘The Summer that Melted Everything’ has prevented me from doing so recently. I don’t have any strange writing habits. I’m pretty boring I suppose in terms of just sitting there and typing. 5) Do you write Longhand, Typewriter, Computer? I wish I was all Hemingway cool and used a typewriter. But I use a laptop. I never say favorite character, because I love them all. But I will say one of the most interesting characters to write was Sal from The Summer that Melted Everything. He’s a character who presents himself as the devil, so he has a very ‘fallen angel’ type of intelligence and that’s always interesting to write because it’s not every day you get to write dialogue for Lucifer. I never outline or write a synopsis. What ends up on the page was what was in my head that day I was sitting at the laptop, typing away. Fielding Bliss has never never forgotten the summer of 1984: the year a heatwave scorched the small town of Breathed, Ohio. The year he became friends with the devil. When local prosecutor Autopsy Bliss publishes an invitation to the devil to come to the country town of Breathed, Ohio, nobody quite expects that he will turn up. They especially don’t expect him to turn up as a tattered and bruised thirteen-year-old boy. Fielding, the son of Autopsy, finds the boy outside the courthouse and brings him home, and he is welcomed into the Bliss family. The Blisses believe the boy, who calls himself Sal, is a runaway from a nearby farm town. Then, as a series of strange incidents implicate Sal – and riled by the feverish heatwave baking the town from the inside out – there are some around town who start to believe that maybe Sal is exactly who he claims to be. But whether he’s a traumatised child or the devil incarnate, Sal is certainly one strange fruit: he talks in riddles, his uncanny knowledge and understanding reaches far outside the realm of a normal child – and ultimately his eerily affecting stories of Heaven, Hell, and earth will mesmerise and enflame the entire town. 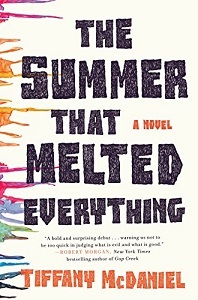 Devastatingly beautiful, The Summer That Melted Everything is a captivating story about community, redemption, and the dark places where evil really lies. I wrote The Summer that Melted Everything in a month during the summer I was twenty-eight. It wouldn’t go on submission until the autumn I was twenty-nine. It sold that autumn. I turned thirty during the publishing process, and I’m thirty-one now as the book comes to the shelf. Publishing a book takes a long, long time. I’m very superstitious so I don’t talk about it. I’m knocking on wood right now. Well one of my most unusual character names in The Summer that Melted Everything is the name Autopsy, and that was because I had seen that word that day I was working and then when I actually looked up the definition of what autopsy means, it fit the character and the theme of the novel so well. In terms of Sal’s name, who is supposed to the devil, his name comes from ‘Sa’ in ‘Satan,’ and ‘L’ from ‘Lucifer.’ A very devilish name, after all. I’d love to see Kate Winslet play Stella Bliss. I think Anthony Hopkins for older Fielding. I do think the young kids are probably going to have to be new actors just coming on the scene. My mom Betty and sister Jennifer always read my novels before I send out to anyone else. Follow Whispering Stories Book Blog with Bloglovin to keep up to date with all our latest posts.